The Ice Warriors haven’t had the most lucky experience with Doctor Who over the years. After appearing in two 1960s stories, and two 1970s stories, they somewhat disappeared from the show. In the 1980s, two planned returns for the creatures were both scuppered when the series was cancelled. They’ve shown up plenty of times in comics and novels since then, but this is their first appearance in televised Who for 39 years. That’s one hell of a nap. 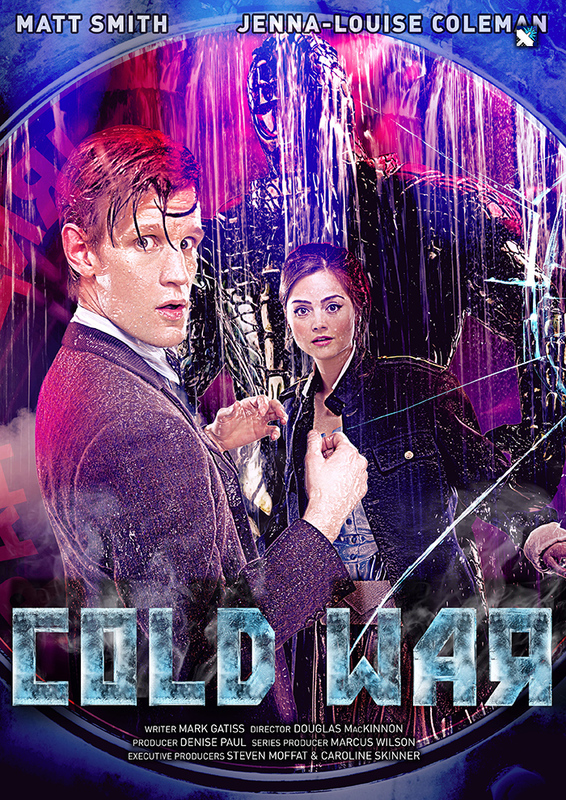 Coming after two adventures set in big, open places - filled with panoramic views of modern London, or overlooking an alien vista with a parasitic sun - the most striking thing about Cold War is the claustrophobia of the episode. The feeling of being trapped on an submarine, with a vengeful alien bearing down on you really comes across, and director Douglass Mackinnon really sells the feeling of entrapment, and ramps up the tension as time runs out for the Doctor and the crew. Praise also needs to be given for just how... wet the set is throughout. Almost every scene features the sub leaking from somewhere, with water streaming down the walls. Visually, it’s quite unlike anything we’ve seen in the programme before - and it’s gorgeous. Of course, the thing that everyone is waiting on this episode for is the reappearance of an Ice Warrior to the series. It’s pleasing that the design of the creature remains true to what we’ve seen in the series before now, and proof that some Doctor Who monsters are so fantastic that they don’t need a big overhaul to make them acceptable to twenty-first century viewers. We see the advancement of the Ice Warrior, though, and it performs a trick that even the Doctor hasn’t seen one do before. Ice Warrior aside, this is another important step for Clara as a companion - her first trip back into history. Following on from last week’s episode, it helps to establish the rules of the programme again for a new companion, and an audience that might have joined since Amy Pond ventured into World War Two in 2010 (in another script by Mark Gatiss, who pens this week’s instalment). There’s plenty of opportunity for Clara to learn about life in the TARDIS: it can get very real sometimes. Elsewhere, David Warner as Grisenko steals the show, puncturing all the end-of-the-world macho-ness with a wonderfully fun performance, roaming the corridors of the submarine singing the hits of the day. Warner’s character is fairly representative of the story as a whole. For all the danger of the Ice Warrior and the threat to the world, Cold War is a very funny episode, filled with great dialogue that really gives the cast - and especially Matt Smith - a chance to shine. 1) It’s probably a mammoth. 2) An Ice Warrior isn’t the only Second Doctor-era invention to appear in this episode. 3) The Doctor is always serious. With days off. 4) Polar Bears are cuddlier than Ice Warriors. 5) It’s not a mammoth. 7.8: Cold War - Promo ImagesThe BBC have released a series of Doctor Who promo images from 7.8: Cold War.10.9: Empress Of Mars - DWO Spoiler-Free PreviewThe Doctor Who Online Spoiler-Free Preview for Series 10, Episode 9: Empress Of Mars.8.4: Listen - DWO Spoiler-Free PreviewDWO’s spoiler-free preview of Episode 8.4: Listen.